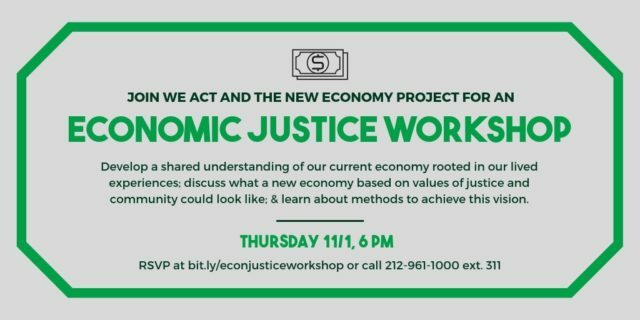 Join us for an Economic Justice Workshop on Thursday, November 1st from 6:00-8:30 PM at WE ACT’s offices (1854 Amsterdam Ave at 152nd Street) to develop a more in-depth understanding of our current economy, including how it works, who it works for, and who it’s failing. We’ll then discuss what a sustainable economic system based on the values of justice and community should look like as well as how we might achieve such an economy. This workshop will be held in partnership with the New Economy Project.